With just 30 rooms, The Hotel Veritas has the feel of a European city hotel. The décor is truly interesting — the modern, Italian-style furniture on the terrace was designed by a Cambridge artist, and the guestrooms are a contemporary take on rich, traditional textiles and colors. Fresh flowers sit on tabletops in the lounge, and photographs commissioned from two well-known locals dot the walls. The rooms are small, but gorgeous design from carpet to crown molding means they feel just right. The colors are soft greens and golds, the linens are Anichini, and the bathroom fixtures, Villeroy & Boch. Windows open to let in fresh air, and there's radiant heat under the bathroom floors. The Hotel Veritas decided it's important for staff to look and feel good. No off-putting operating room-green uniforms here: everyone wears Brooks Brothers. The Simple Truth Lounge serves cheese and charcuterie from Formaggio Kitchen, liquor hand-crafted at local distilleries, microbrewed beer, and a small selection of international wines. A Nespresso coffee machine stands at the ready 24 hours a day, and you can help yourself to bottled water, juice, and tea. The Hotel Veritas is on the eastern edge of Harvard Square. Logan International Airport is 6 miles away. Airport sedan pick up. Email or call concierge at 617.520.5000 for rates. 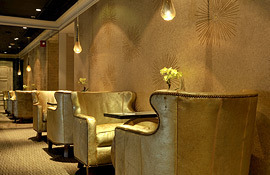 Nespresso coffee, juice, tea, bottled Native Water, and Ines Rosales tortas available 24-hours in the lounge. Must cancel by 6pm 48 hours prior to arrival date.